Well, here it is! This is Kenny's flyer promoting his Eagle Scout Project which will be a training workshop for teachers, school staff, professionals, school board members, parents etc. 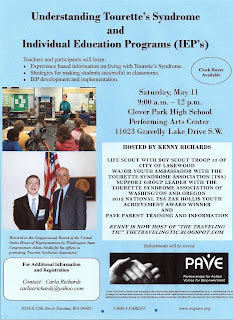 on Tourette Syndrome Awareness and I.E.P.s (Individual Education Plans). Kenny is hosting this workshop and will be one of the presenters as well! This training is especially important for general education teachers to be brush up on their knowledge on how to effectively implement I.E.P.s. in the classroom. Please pass on to any teachers you may know! Teachers will receive clock hours for attending this event! This workshop will take place on Saturday, May 11th at Clover Park High School (Lakewood, WA) from 9:00 a.m. - 12 noon. Mark your calendars!